Oakpark Retirement Community recently organized a special “Summer Sizzle” event for the senior residents. 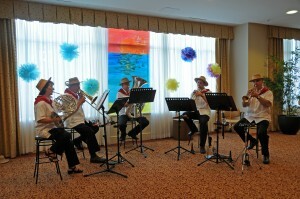 Manotick Brass was there in the group’s Cuban outfits to set the tempo and keep things sizzling! Colourful decorations had transformed the reception hall into a tropical paradise. Many of the residents in attendance had entered into the spirit of the afternoon wearing tropical clothing including the odd grass skirt! Drawing from our extensive library of music Manotick Brass was able to put a program together with a definite Latin flavour. The tropical beat had many people up and dancing and the lively Brazilian finale had everyone joining in a conga! If you have a special program in mind contact let us help you set the scene with appropriate music. Listen to: Brazil recorded live 2011 and join in the conga!